I did actually get it. It is in tougher shape than I expected and I didn't have time to do much other than unload it. I'll put up its own post after I take some pics so as not to hijack this helpful thread, but since you asked I did pick it up. It has warped charcoal grate, junk cooking grate, no charcoal baskets, 2 bowl dings about the size of a half dollar (WTF-on a performer? How?) and worst of all, a HOLE where the lid bale should attach. It's also filthy. On the plus side, it came with, a weber chimney, 5lb propane tank, Performer cover, a nifty charcoal scoop and a brand new kettle tool hook that will go right on my red 18". Also, it was a gas assist SSP for $25 (actually, the most I've spent on a performer yet). So that part was also good. That's great! Yeah the grates get warped from the super high heat of the torch and baskets. I'm looking forward to seeing pics of it. I too have noticed that the bottom grates get pretty distorted on the Performers. I think it's the combination of the upward heat of the burner flame and the downward heat of a chimney full of charcoal. Right in the middle there is some pretty intense heat, I imagine. I replaced the bottom grate on my Performer last fall, and it's already getting all wiggy. And jkolantern, you can still get those old-school wire-style coal baskets from Weber if you like. I can't find the part number anywhere, unfortunately, but they will sell them to you. Or if you prefer the newer stamped-metal style, I've got a hot tip: Weber will sell you a set of them in a retail box for like $18/pair, or if you purchase them individually you can get them for $3.75/apiece. The stock number for the individual baskets is #62423. I know I'm late on this but Great job PBE!! you do outstanding work! Because Here we are Friends. Here we are Brothers. A family in the name of Weber. And jkolantern, you can still get those old-school wire-style coal baskets from Weber if you like. And nice catch, Hank! That's about what I paid Weber for mine. Then I found a whole SS Performer complete with wire coal baskets the next week for just $25 total. Murphy's Law, I guess, but I'm not complaining. I'm definitely hopping onto 2 of these. Thanks for the link. 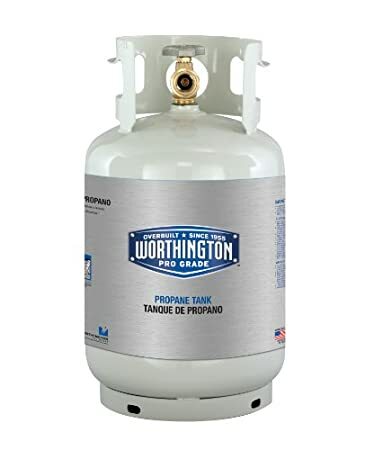 I ordered an 11# propane tank from amazon and adapter that I am going to fit onto the SS. The tank comes tomorrow and the adapter hose comes in Thu. I did a very similar thing on my first Performer! Bought my C&B grey with wasted pop metal baskets, didn't know the old ones were still available, and shelled out like $16 bucks at the Depot for a set of the new style ones...then bought an SSP with the old school baskets for $20. The green I bought will just be a fix & flip I think so I'll let the new owner buy baskets...I can't fully justify keeping 2 performers, let alone 3, with all my other grills. So my tank came in this week. I was so excited! I could have saved a few bucks by going with a 20# but the 11# fits so much nicer. It's a little larger than the 5# tank- trying to hang it on the standard hook causes the tank body to hit the front panel of the performer. To make matters worse, the wide handle hole that is on the collar is 90deg in the wrong direction. Looks like I have another part to make. IT DOES NOT FIT THE REGULATOR- The fitting at the end is 1/4" NPT and the regulator to quick connect is 5/16" Oops. So I bought a 5/16" NPT barb adapter from the hardware store. Unfortunately the hardware store didn't have a 5/16" NPT fitting with 1/8" or 3/16" ID barb. This one is a 1/4" ID barb- The same ID as the tube. It was a b!tch to put on, but I hoseclamped it securely. Since this performer is out of commission for the moment I used the WSM this week. I made 6 spatchcocked chicken on Thursday. Here is the top rack and the bottom rack is in similar formation. It's nice having Multiple Webers sometimes! I realized I should probably share my rationale why I went this route with the regulator. 3. Buy the old style assembly with the OPD/QCC1 adapter. 4. The Gummi Bear option- new tank with normal modern valve, but adapt the existing regulator. I decided against 1 because at the end of the day I would still have an old tank that is difficult to fill and would be specific to my performer. I called around a few places to see if they would fill an RV quick connect but I soon realized I didn't want to go through the hassle. I decided against #2 because it would cost me about 40 dollars in parts and I don't like discarding parts that still work- ie. my existing line and regulator. I would have also had to make a custom bracket for the valve that is oriented 90deg from the tank, and disposable tanks aren't economic and environmentally friendly. #3 is an attractive option but I didn't realize until very recently that they introduced this at the end of the ss life cycle. Even if I went this route, I would need a new valve on my tank. I like the 11# tank because it can be filled at any station, portable enough to take on trips, and fit underneath the table cleanly. Aesthetics were very important to me and a 20# tank would have stuck way too much. Good looking chicken, what color are you plastidipping the lid bale? WOW! How did I miss this post!? Outstanding restore jobs Lawrence! This will definitely help for when I eventually find that Holy Grail SS red. This needs to be archived. Very Nice!! I'm gonna be the bad guy here and say that the Hose connected with a barbed fitting is not the best idea. Hose clamps are not meant to hold propane pressure. Sure its only under pressure for a few minutes, but any leak could be dangerous. I trust Gummi is aware and will keep an eye on it. My suggestion is to get the updated parts or do what I did, I replaced the connector that threads directly into the regulator. Be sure to use the correct thread sealent for a gas fitting. Thanks for the tip, AJ. You bring up a good point! Better safe than sorry. Ill update it soon.